Police are appealing for help from the general public in identifying a man who they believe was responsible for an assault and robbery, which occurred in Acton High Street on Thursday 16th August 2007. They have released a CCTV image of the suspect which appears to the right. At approximately 04.15 a member of the public flagged a police car down following the robbery and assault of a male on a Route 266 bus. The victim, a male in his fifties, explained to officers that he got on the Route 266 bus shortly before 0400hrs near Willesden Green Junction train station and took a seat upstairs on the bus. A man boarded the bus at the Clock Tower, Craven Park, Willesden, NW10 and took a seat upstairs. 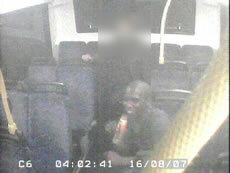 As the bus travelled through Acton the suspect approached the victim and demanded money. The victim, who does not speak English, was unable to understand and was then viciously assaulted and had his Sagem mobile phone stolen. The driver heard the disturbance and immediately stopped the bus. At this time the suspect has made his way down the stairs and alighted the bus running across Acton High Street. He was last seen running southbound along Berrymead Gardens. The victim suffered a broken nose, a laceration above his left eye and was bitten on the arm during the attack. The suspect is described as a black male aged around 20-25, 5ft 6", slim build, shaven head and wearing a green jacket, green t-shirt and dark blue jeans.